The latest version of PDF file including Lesson 2a, 2b, and 2c is available for download. Spelling and usages in Burmese script are consistent with (and checked against) the Spelling Reference Book and Burmese to Burmese Dictionary published by the Ministry of Education in Naypyitaw, Myanmar. More than 130 Audio files are zipped for easy download and offline study. Text, CSV, and Excel files with audio file names, corresponding Script, Romanization, and English meaning are added to aid in self-study. SUMMARY OF WORDS AND PHRASES WITH MP3 AUDIO. Complete sentences in Romanization start with capital letters. CLICK (OR TOUCH) COLUMN HEADERS TO SORT phrases in ascending or descending order. Ba2 lo2 chin2 leare3 What do you want? Ba2 loat chin2 leare3 What do you want to do? Ba2 loat ja1 ma1 leare3 What shall we do? Ba2 sa3 ja1 ma1 leare3 What shall we eat? Beare2 dau1 la2 ma1 leare3 When will you come? Beare2 gah1 pyan2 la2 leare3 Come back from where? Beare2-hma2 leare3 Where is it? Beare2 hna1 yout leare3 How many persons? Beare2-lo2 leare3 How is it going? Beare2-lo2 thwa3 ja1 ma1 leare3 How shall we go? Beare2-lout lo2-chin2 leare3 How much do you want? Beare2 thwa3 chin2 leare3 Where do you want to go? Beare2 thwa3 ja1 ma1 leare3 Where shall we go? byi2 la3 has reached certain stage? Da2 ba2 leare3 What is this? Da2 beare3 This is the one! Da2 lo2 chin2 deare2 I want this one! De2-lout lo2-chin2 deare2 I want this much. De2-lout lo2 deare2 I need this much. Hote pa1, Hote pa1 Absolutely! Hote yeare1 la3 Are you sure? Correct or not? Kone2 byi2 la3 Used/eaten up already? Kone2 byi2 Used/eaten up already. Koun3 ba2-deare2 I am fine / It was OK.
Koun3 ba2-deare2 lay2 whatever... is good. Koun3 byi2 lay2 Good! Well, I am glad. kjay3 zu3 merit done on an another person. Kjay3 zu3 tin2 ba2 deare2 Thank You! la3 Question mark at the end of the sentence. Lo2 chin2 deare2 I want it. Lo2 chin2 la3 Do you want it? Lo2 deare2 I need it. Lo2 la3 Do you need it? Lout byi2 la3 enough already? Lout la3 Do you have enough? Ma1 hote thay3 bu3 Still not right! Ma1 kone2 thay3 bu3 I haven't used/eaten up yet. Ma1 kone2 thay3 bu3 la3 Haven't used/eaten up yet? Ma1 lo2 bu3 No need! Ma1 lo2 chin2 dau1 bu3 I no longer want it. Ma1 lo2 dau1 bu3 I no longer need it. Ma1 lo2 thay3 bu3 I don't need it yet. Ma1 loat chin2 dau1 bu3 I don't want to do it anymore. Ma1 loat dau1 bu3 I am no longer doing it. Ma1 lout thay3 bu3 la3 still not enough? Ma1 pyi3 thay3 bu3 Haven't finished yet. Ma1 pyi3 thay3 bu3 la3 Haven't you done it yet? Ma1 sa3 chin2 dau1 bu3 I don't want to eat it anymore. Ma1 sa3 dau1 bu3 I am not going to eat. Ma1 sa3 yah1 thay3 bu3 I haven't eaten yet. Ma1 sa3 yah1 thay3 bu3 la3 Haven't you eaten yet? Ma1 thwa3 bu3 I am not going. Ma1 thwa3 chin2 bu3 I don't want to go. Ma1 thwa3 chin2 dau1 bu3 I no longer want to go. Ma1 thwa3 chin2 thay3 bu3 I don't want to go yet. Ma1 thwa3 dau1 bu3 I am not going anymore. Ma1 yah1 thay3 bu3 Haven't got (or ready) yet. Ma1 yah1 thay3 bu3 la3 Haven't got (or ready) yet? Ma1 yout thay3 bu3 We are not there yet. Ma1 yout thay3 bu3 la3 Are we not there yet? Nay2-koun3 ja1 ba2-deare2 We are fine. Nay2-koun3 ja1 la3 How's everyone? Nay2-koun3 la3 How are you? Nin2 beare2 ma1 leare3 Where are you? Pyi3 byi2 done! / It's over. Pyi3 byi2 la3 Finished already? Sa3-koun3 yeare1 la3 How was the food? Delicious? Sa3 pyi3 byi2 Yes, eaten already. Sa3 pyi3 byi2 la3 eaten already? Thate koun3 ta2 beare3 It was very good! Thwa3 chin2 dare2 I want to go. Thwa3 chin2 la3 Do you want to go? Thwa3 ma1 la3 Are you going? Thwa3 meare2 Yes, I am going. Thwa3 ome3 meare2 nau2 Got to go now! Tway1 yah1 ta2 wun3-tha2 ba2 deare2 Nice (or glad) to meet you! Yah1 byi2 la3 Have you got it? Is it ready? Yout byi2 We are there. Yout byi2 la3 Are we there yet? How to Invite Someone in Burmese? Myan2 ma2 pyi2 go2 la2 leare2 ba2 ome3 -- Won't you visit Myanmar? You can substitute "Myan2 ma2 pyi2" with the list of countries around the World in lesson 19. You can use the same sentence structure to invite someone to your house. Ain2 la2 leare2 ba2 ome3 -- Please visit our house. That phrase will come in handy if you are already in Yangon, and if you want to practice speaking Burmese. 1 May peace be with You! 22 Want to go or not? 24 Do you need it? 26 How much do you want? 27 Do you have enough? 38 How was the lesson? In the previous lesson, I have covered the comprehensive list of Burmese tones in a system similar to Hanyu Pinyin tone system. Please refer back to the discussion on Tones in Burmese for the detailed explanations on the correct pronunciations of the words. In this lesson, we will start with some useful simple Burmese phrases. 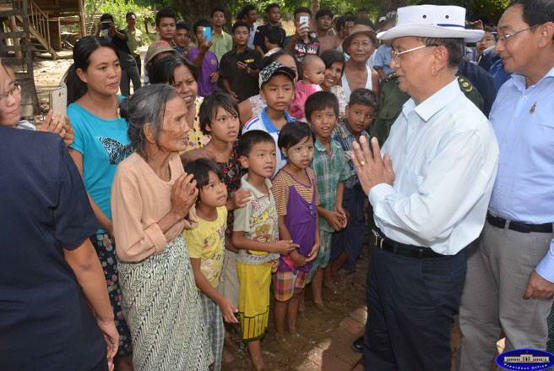 This type of greeting from a person of higher social status to someone who is younger or of a lower social status is not yet common in Myanmar. 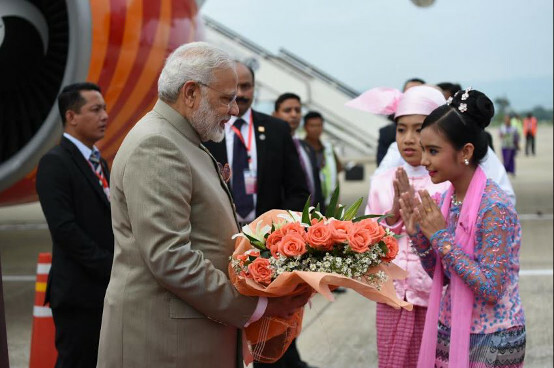 U.N. Secretary General Ban Ki-moon had introduced this gentle culture originated in ancient India by returning his extended palms firmly pressed together as a gesture of courtesy to Burmese well-wishers who greeted to him in a similar manner. It came as a pleasant surprise and bewilderment to the onlookers who were not accustomed to such returning of the salute. Pressing of the raised palms during the greeting with mutual respect is not yet commonly practiced in Myanmar like 'Wai' greeting in Thailand or 'Namaste' greeting in India. Usually, this gesture is a one-way respect from the younger person to the elders, to the monks, or Buddha images and Pagodas. The tradition can be traced back to Ancient India 4,000 years ago, and is called Anjali Mudra in Sanskrit. If you are a foreigner greeted with Min2-gla2-ba2, it's OK to reply with Min2-gla2-ba2 accompanied by a simple nod and a smile. That's the standard greeting that you might have read it or heard of before. "Min2-gla2" has attributes of wholesomeness, graciousness, joy and freedom from imperfections. It is quite close to the English word "auspicious", but "auspicious" is the adjective usually associated with day or event, whereas "Min2-gla2" bestows those attributes to the human being. "Hello, welcome and enjoy a perfect occasion!" The word Min2 ga1 la2 in Burmese greeting min2 ga1 la2 ba2 comes from the ancient Pali word meaning 'something auspicious', 'good luck', or a 'good omen'. Min2 ga1 la2 ba2 is a formal word used to greet teachers, hotel guests, and customers. Another common usage to min2 ga1 la2 is min2 ga1 la2 hsoun2, which means to marry and wed with a formal ceremony. In one of the most popular Buddhist Suttas (sermon) known as "Maha-mangala Sutta", the Buddha teaches on how to live a happy life by common sense approaches such as avoidance of bad company and developing the serene mind. Source: Buddhist Dictionary, Manual of Buddhist Terms & Doctrines by Ven. Nyanatiloka. Myanmar Grammar Notes: "Min2-gla2" is a noun in Burmese grammar. The correct translation of auspicious is min2-gla2-shi1-dthau3 (adjective). When addressing to a female teacher, "ma1" is added to "hsa1-ya2". hsa1-ya2-ma1 -- could refer to a female teacher, a female nurse, a female superior, a female doctor, or any professional-looking female. Hote-keare1 hsa1-ya2-ma1 -- Yes, madam! Note: The 7th Burmese character Hsa1 sounds almost like the 6th character Sa1 but with more hissing sound. Please refer to lesson33 for pronunciations of consonants. Nowadays, on the Internet Chat and SMS, a short form of "yes" is commonly used.. Question: Hote la3 -- Is that so? Literally, it means "yes?" There are more than one way to say "yes" depending on the context. We will discuss more in lesson 3. A good word to know: "koun3"
Koun3 yeare1 la3 -- Is it to your liking? Good or not? Koun3 deare2, in this case, is the answer "yes" to the question "good or not". You use back the word Koun3 (adjective) in the question. Koun3 deare2 can also be a statement. For example, after you have tasted delicious food, you can say Koun3 deare2 -- Good! When the word la3 (particle) is added to the end of the sentence, it becomes a question mark. The word nay2-koun3 is a verb meaning feeling well. It is a compound word made up of nay2, which is a short form of the word nay2-htine2 meaning to live or to dwell. The word koun3, as we have seen earlier, means "good". Also note that the question has the verb portion nay2 and the adjective portion koun3. In the answer, the verb portion nay2 is omitted. The word ja1 (particle) indicates that the conversation refers to more than one person. Showing doubt and concern with "yeare1"
yeare1 (postpositional marker) is added when the person asking the question has no idea on the situation of the conversation, and it put the tone of concern, doubt, and a sincere desire to know what's going on. When you don't hear from your family for a long time and wondering if they are OK or not, you add yeare1 mentioned above to seek assurance and to show concern. Ba2-deare2 is the positive affirmation in the answer. "Ba2" in the word ba2-deare2 is a polite word which softens the feeling tone, and at the same time put the emphasis on the verb or the noun before it with the meaning somewhat like "indeed". 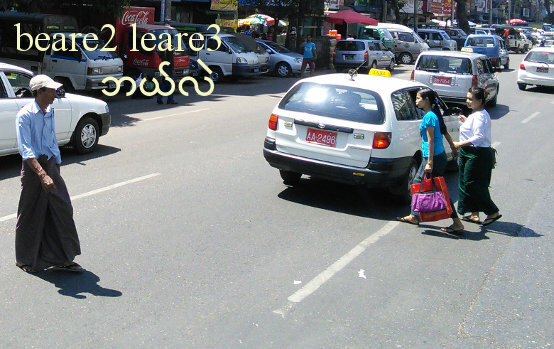 (It is spelled as "pa2" in Burmese script.) Some phrases sound too abrupt without this word. Hote ba2-deare2 -- Yes, the way I see it. Yes, that's right! "Well, the way it turns out... it's good that way. We have to look at it positively and accept the situation..."
The word delicious is coined by sa3 - to eat, and koun3, which means good. Also note that the verb sa3 is omitted in the answer just like the answer to "how are you?" question. The particle "ta2" modifies the adjective "koun3" into a noun "koun3-ta2", which means something that is good. So, Thate koun3 ta2 refers to something extremely good. Beare3 is the emphasis ending word roughly means, "exactly" in this case. Thate koun3 ta2 beare3 -- It was very good! In lesson 8 we will discuss more on how to express yourself better using adverbs. Beare2 leare3 -- Go where? Where to? Beare2 gah1 pyan2 la2 leare3 -- Come back from where? The word pyan2 la2 is to come back, and gah1 means from. When it's near breakfast, lunch, or dinner time, she might say..
Sa3 pyi3 byi2 la3 -- Eaten already? where pyi3 byi2 means "done". Speakers of some other languages will be interested in learning how to say those greetings in Burmese. For example, Malay and Indonesian languages have standard greetings like "Selamat pagi", "Selamat petang", "Selamat malam", and so on. Yes, it is possible to directly translate "Good morning", "Good evening" and "Good night" into Burmese. But, you will sound very odd and people will look at you in a funny way when you say those phrases. Although "Good Morning" is not a common usage in colloquial Burmese, you will probably hear radio DJ's using the term: min2-gla2 ma1-net-khin3 ba2. ma1-net means morning, and khin3 covers the whole region or stretch of time. You will also hear more usage of the term min2-gla2 ba2 by commercial establishments such as restaurants and hair saloons as they compete for customers. Tway1 yah1 ta2 wun3-tha2 ba2 deare2 -- Nice to meet you! What if you have already met the person before? What kind of greeting can a foreigner say to a Burmese? Just say "hello" in English. Nay2-koun3 la3 to one person or Nay2-koun3 ja1 la3 to more than one person would also do fine. You probably know that kjay3 zu3 tin2 ba2 deare2 means Thank you. But, exactly what does it mean in Burmese? Here's the break-down. kjay3 zu3 -- a good work (help or merit) that a person does on an another person. tin2 -- to explain the facts and make a report as in tin2 pya1. It could also mean to have left behind a debt and gratitude in this case. ba2 deare2 -- polite ending word with emphasis on tin2. The word la3 is used at the end of the sentences to form questions which expect "yes" or "no" answer. The word leare3 is used at the end of the sentence for all 6 W's and 3 H questions: "what", "which", "where", "who", "why", "when", "how", "how many", and "how much". Ba2 is used in the beginning of the sentence to ask "what" and "why" questions. Don't confuse this Ba2 with suggestive and polite ba2 at the end of the sentences and phrases such as the greeting: Min2-gla2-ba2. They sound alike but spelled differently. Please refer to PDF file with Burmese Script. You will see those patterns as we go along. Here comes a list of basic questions, answers and phrases. Simple negative statements will have the pattern Ma1 xxxx bu3, where xxxx is either adjectives such as "hot", "cold", or the verbs such as "need", "like". Simple positive statements will have the pattern xxxx deare2, where xxxx is either adjectives such as "hot", "sweet", "red", or the verbs such as "hungry", "thirsty". Normally, "hungry" in English is an adjective as in "hungry dog" unless it is used with the verb forming word in the sentence such as "I (am hungry)". Burmese word hsa2 is not an adjective but a verb "be hungry" in hsa2 deare2 -- I am hungry!. 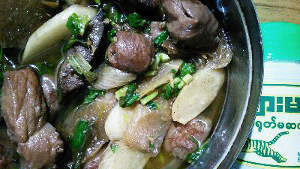 It can be used with the adjective forming particle as in (hsa2 dthau3) khway3 -- hungry dog. Similarly, several words that you would normally expect to be adjectives in English are used as verbs in Burmese. Myanmar got talent. Go ahead girl. Give your best shot. Ask "Where are you?" in less than one minute. Myanmar got talent. Go ahead girl. Give your best shot. Ask "Where are you?" in 55 seconds. How about that for improving your listening skills? She said "where" word four times in 55 seconds. Can you catch them? She reversed the question: "You + where?" to "Where + you?" and "Where + he?" to put more stress on the "where" word. We will go over "you" and "he" words later in Lesson 4. Here, I will give just one informal "Where are you?" By the way, her name is Eint Chit | ain1-chit and she also wrote the lyrics. Watch her when she was even younger back in 2009. The starting part of this song is in lesson 4. 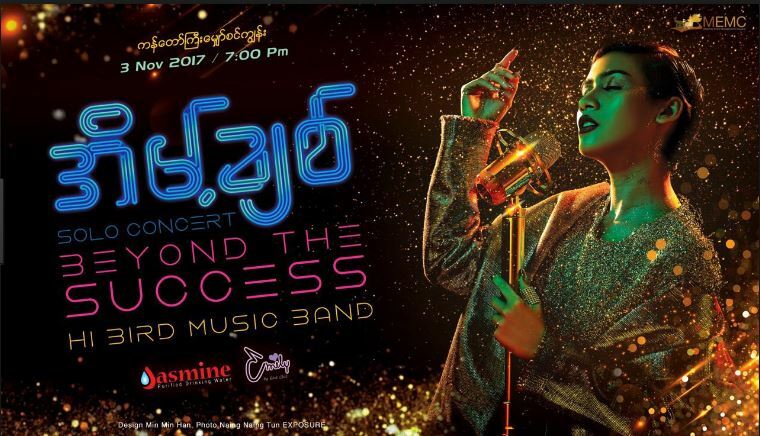 This rising star was discovered by Coca-Cola Myanmar and named the brand ambassador in April 2015 to join Sai Sai Kham Leng and Mi Sandi to tour the country. Objects, subjects, people, places, or the words pointing to the nouns such as "this", "that", "he", "they" always come first in the question words: "what", "where", "who", "when", "why", "how", and "how much". The sequence is the same as Chinese, but opposite from English. Want to go or not? What's the difference between Lout la3 and Lout byi2 la3 ? Usually, byi2 la3 is used to ask the question during some kind of action or activity. For example, you can say Lout byi2 la3 while you are giving cash to someone to buy something. Have you reached the condition xxxx "byi2 la3"? The question word byi2 la3 such as in "enough already?" above has several uses. Note the similarities in sentence construction. The same word yah1 can also mean something is available, can be done, or ready. You can say yah1 byi2 la3 to ask if the repair is done, or if the dinner is ready. In lesson 15, the phrase be2-ya2 yah1 ma1 la3 is used to ask if beer is available. As for the informal Burmese greeting "Eaten already? ", there is a slight difference for the "not yet" answer. The answer Ma1 sa3 yah1 thay3 bu3 implies that the speaker has not got the opportunity or time to eat yet. If the question is asked in the middle of your meal and not a greeting, you can answer: Ma1 pyi3 thay3 bu3. Haven't you xxxx "thay3 bu3 la3"? Just like in English, "Have you got it already?" can be re-phrased by the negative question: "Haven't you got it yet? ", negative questions in Burmese can be formed by the words thay3 bu3 la3. Use the phrase "Ma1 xxxx "dau1 bu3" if you no longer do, want, or need something. Note that "why" is the question "what" ( Ba2 leare3 ) with "joun1" in the middle. Ba2 joun1 leare3 is a question "why" as in a scientific investigation, whereas Ba2 pfyit-lo1 leare3 is more of a personal question. Do you see the pattern of "who" and "which" with the word "where" beare2 leare3 in them? Similarly, "how" also has the pattern beare2...leare3. If you recognize those patterns, it will be easier for you to remember the questions: "how much", "what", why", "which", "how", and "where". Beare2 dau1 la2 ma1 leare3 -- When will you come? We will discuss the details of "when" question in lesson 14. The word ma1 is the colloquial form of hma2, which is a preposition "in" "at" "on" in English in "where" question, and also colloquial form of myi2, which indicates the intention to do something, and roughly future tense "will" in English. Burmese language uses "measure words" to ask and answer "how many" type of questions. When you say "a cup of tea", "two glasses of water", or "3 persons", "cup", "glasses", and "persons" are measure words. So, you need to have some familiarity with those measure words to ask questions like "How many cups of tea do you want?" Beare2 hna1 yout leare -- How many persons? When the waiter in the restaurant or the front desk in the hotel asks you this, yout is the measure word used for the number of people. So, Beare2-lo2 leare3 -- How did the lesson go? But, how was the teaching? koun3 yeare1 la3 -- Good or not? Koun3 ba2 deare2 lay2 -- Oh, well... acceptance with a sigh..
Hote ba2 deare2 -- Yes, the way I see it. Hote pa1, hote pa1... Yes, I agree with you absolutely!